Database converter program for MySQL to MS Excel provides easy way to convert database records created in My SQL to MS Excel spreadsheets. 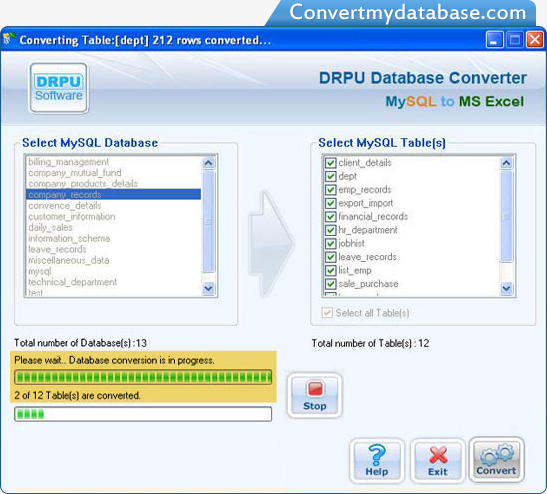 MySQL to MS Excel Database Converter Software provides instant help to database programmers, DBA and other users who want to save time in creating database records from beginning especially if need to convert multiple (bulk) records. The database conversion program is easy to use and does not require any database programming knowledge to use it. Convert single or bulk database records as per need. Optimized solution for bulk database conversion. Supports major database attributes and key constraints. Supports all MySQL data types and attributes. Supports all major versions of Windows MySQL Servers. Full install and uninstall support. Easy and safe to use database conversion program.